We have recently added Accoyo Markman's Momentum to our Alpaca Tracks herd. 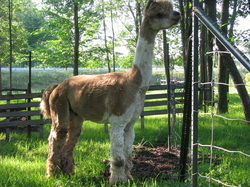 Momentum is out of Marmalade and Accoyo Marksman from Blueridge Alpaca Ranch in Wisonsin. Marksman is a medium fawn Full Accoyo multi-color champion. Marmalade has produced several champion cria, and Momentum is no exception! Momentum's fleece has Marksman's spiraling shiny bundles. His fleece has a high frequency crimp within these bundles. Momentum has straight strong bone structure on a boxy frame. Momentum carries some impressive blood lines such as; Matador, Albus, Express, Vengador, Royal Avenger, Royal Fawn, Isis, India, and Caligula. Momentum could easily throw black or a variety of colors with his background. Our many times over male multi-colour champion, Elvis has his first crias on the ground. He is giving us crias with super fine, crimpy fibre with amazing lustre. Elvis is a well porportioned male with a very gentle attitude and he passes on his gentle disposition to his offspring. Elvis' distinct colouration makes him unique. Desi's Arnez isn't a stranger to the winner's circle. Arnez has beautiful dense crimpy bundles of fleece with beautiful lustre. He has perfect comformation and a great disposition. His bloodlines include Victor's Vaccoyo and Peruvian Enrique. At the age of three, we will introduce Arnez to our breeding program in the summer of 2013.